Paul Oberlercher was an Austrian elementary school teacher. He worked and lived in Carinthia. 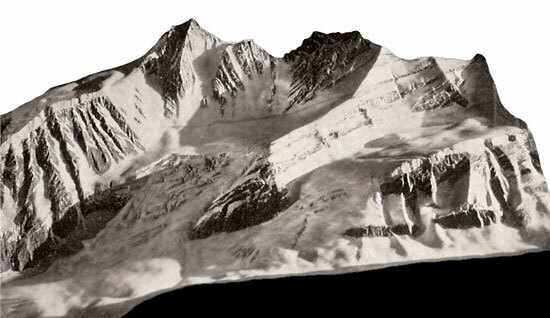 In 1890, he created his main work, the large-size model of the Grossglockner in 1:2,000, measuring 24.5 m2 (7 x 3.5 m). He coloured the large model of Carinthia, with 182 m2 the largest relief of Europe, built between 1889 and 1913. Although he learned the art of terrain modelling as an autodidact, he is considered to be the best Austrian modeller. He used the same techniques as the Swiss relief artists of that time to create his 37 models. Grossglockner (Austria) 1:2,000, on display at the Landesmuseum Kärnten. Penck, Albrecht. Neue Reliefs der Alpen. 1904; Penck, Albrecht. Oberlechner’s Glocknerrelief. 1896. and Berger, H. Geoplast Paul Oberlercher. 1956.